1. Western Countries Dominate Nobel Awards. 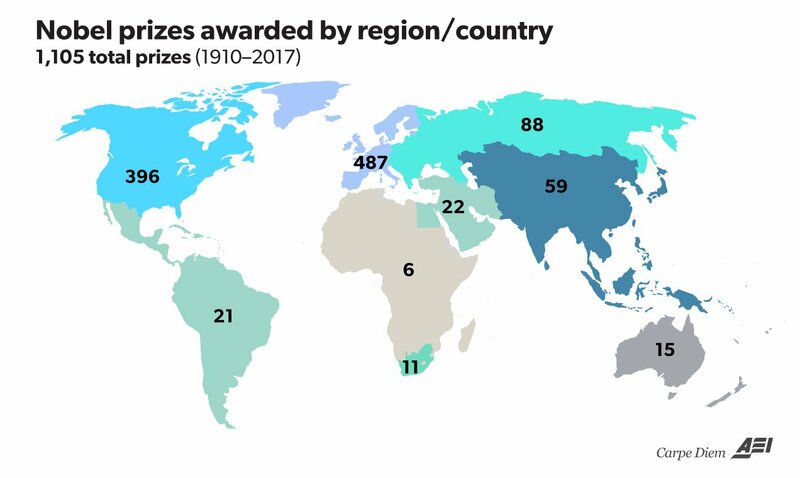 […] a) the US and Canada (403 awards) and b) Western Europe (495 awards) together represent the vast majority of the 1,107 country affiliations associated with Nobel laureates, and more than 81% of the total number of laureates since 1901. 2. Top Ten Nobel-Winning Countries. 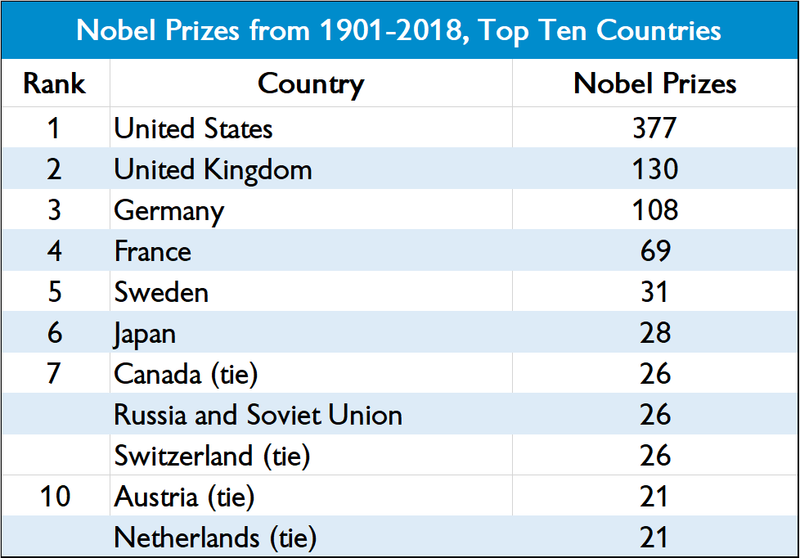 […] The United States is by far the world’s leading country for receiving Nobel Prizes with an astonishing 377 individual laureates over the last 118 years (and 41.7% of all 904 awards), which is almost three times more than the second-highest ranked country — the United Kingdom, with 130 awards (see table above). 3. Latin America, Asia, Africa, and the Middle East together account for only 116 Nobel Prizes by country in total (10.5% of the 1,107 total), even though those areas together represent about 85% of the world’s population. 4. Asia. Laureates in Asia alone have been awarded 57 Nobel prizes, or 5.1% of the total prizes by country affiliation with nearly 55% of the world’s population. Nobel Prizes for Japanese laureates (28) represent close to half of all Asian awards, followed by India (1o) and China (8). 5. Middle East. Countries in the Middle East have received 22 Nobel Prizes, with more than half (12) of the awards going to Israeli laureates. 6. Africa is the region of the world with the fewest Nobel Prizes – only 17 in total, and only 7 outside of South Africa, even though Africa has a population of about 1 billion. 7. Jewish Nobel Laureates. Interestingly, Jews and people of Jewish descent represent less than 0.20% of the world’s population, but they represent more than 22% of all Nobel laureates (203 out of 904). 8. Nobel Laureates by Gender. Men have been awarded 847 Nobel Prizes compared to only 51 prizes awarded to female laureates. 9. Research Affiliations of Nobel Laureates. 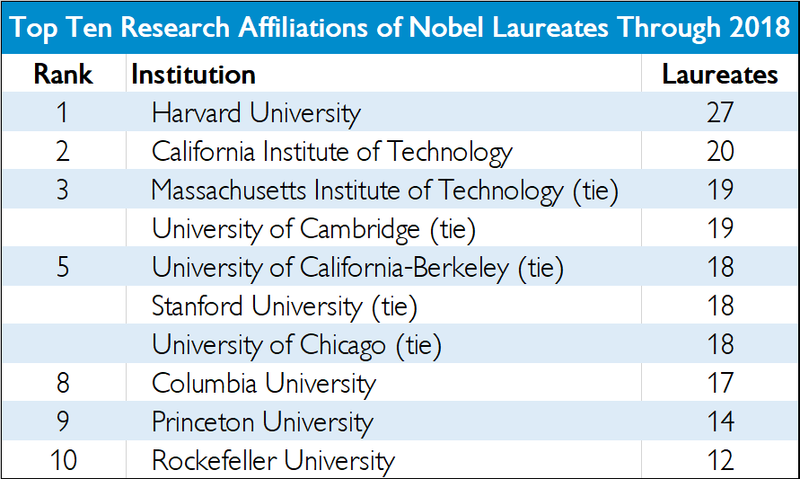 The table [below] shows the top ten research affiliations of Nobel laureates at the time of the announcement. 10. Nobel Prizes by Age. 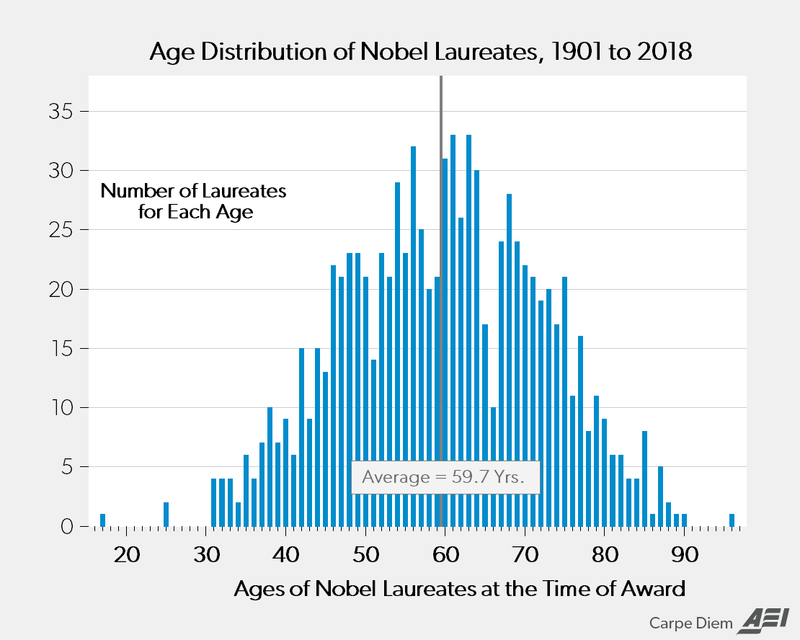 […] The chart below shows the age distribution of the 904 Nobel laureates, whose average age was 58.7 years old when the prize was awarded. By individual age, there are more laureates who received a Nobel Prize at age 61 or 63 years (33 individuals for each age) than any other age, followed by ages 56 years (32 laureates) and 60 years (31 laureates).